La edición pasada de EL LATINO del 22 de diciembre fue la # 300 desde que iniciamos nuestras publicaciones en el año 2001. !Felicitaciones y muchas gracias a todo el equipo de colaboradores de EL LATINO, a nuestros, amigos, lectores y anunciantes! • Michel, if there were an Arkansas Person of the Year - my vote along with many others listed here would be voting for you and all you have done to create a media network for Latinos. Andale pues mi amigo. • Conngratulations, Michel and the full staff of “El Latino,” for this success. May the next 300 issues be equally interesting in content and colorful in format. Darlene Kurtz, Welcome the Children, UAMS. Julian Calzada, Presidente LULAC Little Rock. • Congratulations Michel and thank you for all that you do. Have some great holidays and God Bless us one and all. • Congratulations! Great work and everyone that uses El Latino really enjoys it! Que lleguen a 300 más! • Thanks, and all the best this holiday season. • Michel, parece increible que ya pasaron 6 años. Felicidades! • Second Terry Trevino’s comment, Felicidades y muchas gracias por todo! • Michel. Congratulations. That is real accomplishment! • Congratulations! The paper is needed in Central Arkansas. Besides, you’ve helped me learn a little Spanish!! • Felicidades en ese logro tan importante. Gracias por tus contribuciones y por los compañeros que te rodean haciendo que “El Latino” sea un éxito. Que Dios los bendiga a todos y que pasen una feliz navidad junto a sus seres queridos. • Congratulations to you, Michel, for all your hard work! • The information you provide is invaluable to those of us working with the Latino population. Gracias!! Feliz Navidad!! • !Enhorabuena! 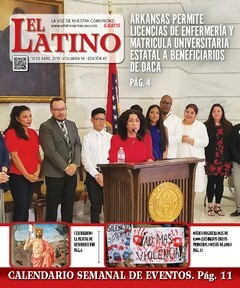 A todo el personal de El Latino por la trayectoria informativa del periódico para la comunidad Latina del estado de Arkansas. • Thanks Michel -- and CONGRATULATIONS on publishing #300 -- what an accomplishment!! Thanks again, and happy holidays!! • This is wonderful news!! May you have a doubly Blessed New Year!! • Congratulations you try to have us informed, can you address the exploitations that exist among Hispanics? Keep up the good work. • Un abrazo mi hermano por tu edición 300. Eres un orgullo para nosotros. Adelante en la labor que realizas. Cuídate y recuerda que aquí tienes un amigo para lo que necesites. • WAY TO GO, MICHEL!!!!!!!!!!!!!!!!!!!!! • By the way, congratulations on the 300th issue of the paper-I think it has improved continuously over the years in all aspects-content, appearance, value of information, and lead-in to other media like radio. It really has been a great community service that the people make daily use of in their lives. • I agree with Professor Richard. El Latino is vital to the community. • I do not live in Arkansas but thanks to you and Willie Cosme, I received EL Latino. I will like to joint the group of people who congratulate you for the excellent and professional work that you are doing. Your articles help me to be knowledgeable in issues affecting the Latinos, not only in Arkansas but also in the rest of the nation. Your professional style, importance of the issues you send us is extremely important to me and help me in my job in Migrant Education. Congratulation! Wishing you joy, health and peace in this holydays season! • Mr. Leidermann-- You are to be congratulated for this achievement. The service--educating and informing--that you provide to the state is invaluable. Given what I know about business, I am sure that some of those 300 issues presented some real challenges. Many people give up. You did not. • Michel: Felicidades de parte de la Suprema Corte de Arkansas. Su contribución a la comunidad hispana es muy valiosa.